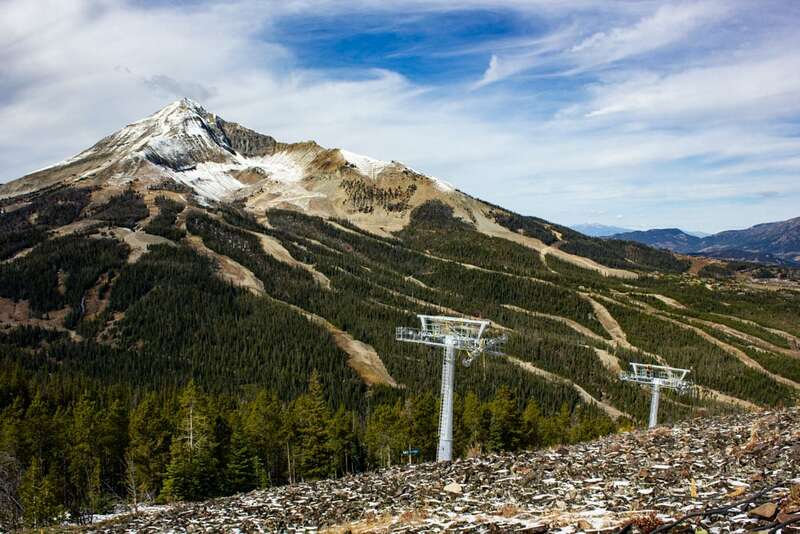 The most modern chairlift that’s ever been built is now open at Big Sky Resort. 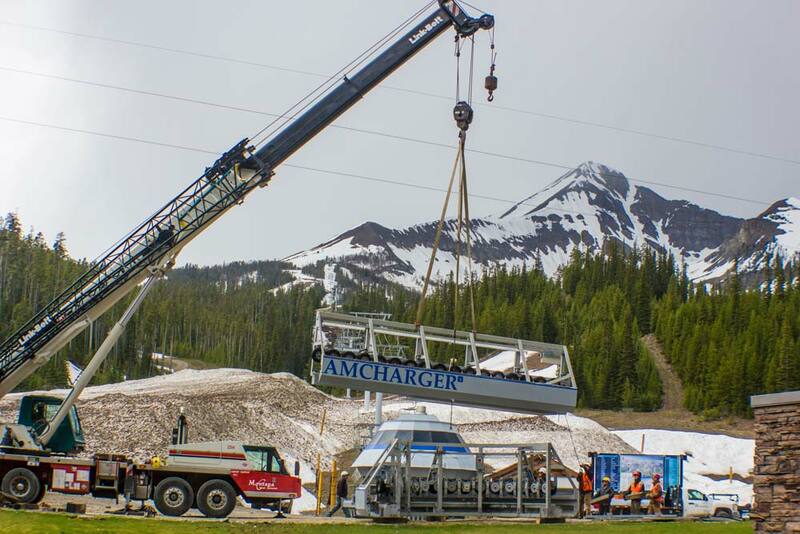 Ramcharger 8, an eight-seat, D-Line chair with ergonomically-shaped, heated seats and a "Big Sky blue" bubble, now transports 3,600 skiers per hour to the top of Andesite Mountain. 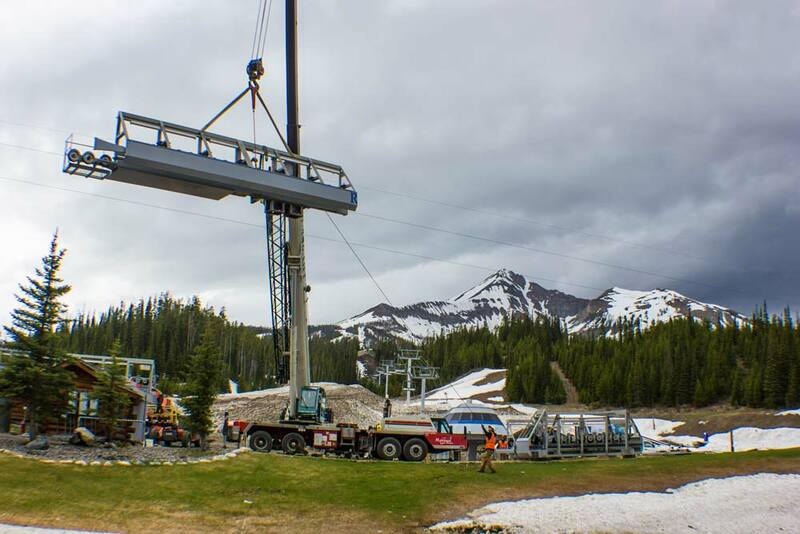 Boyne Resorts partnered with the Dopplemayr shop in Wolfurt, Austria to bring its most technologically-advanced lift to Big Sky, Montana. Jamie Kanzler, Peter Weideman, and the entire Doppelmayr team for undying dedication and persistence. They started the summer working 60 hour weeks and have spent the last couple months working 7 day/weeks in order to finish on time. 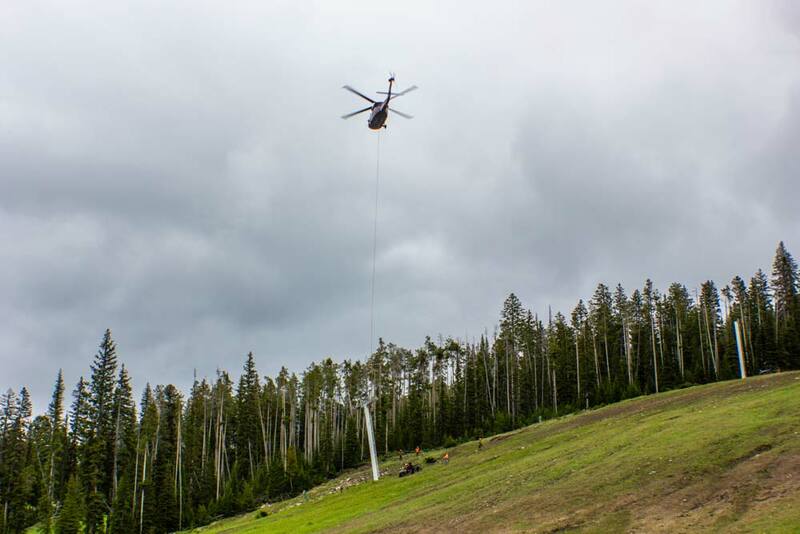 John Knapton and the entire summer slope crew who moved tens of thousands of cubic yards of dirt, dropped trees, moved thousands of feet of snowmaking, collaborated on planning, etc. Ben Macht, Eric Schwartz, Ben V and Daphne of Lift Maintenance, for working weeks without days off to help Dopplemayr complete the project, and the whole Lift Maintenance team. Ross Smethurst and his lift operations team for putting in extra days for weeks on end and picking up all sorts of tasks to complete the project. Chad Rocthacher and RMR for their great partnership in planning and completing on mountain buildings. Mark Tedsen and Mtn Home Technology for all of the electrical work. Milesnick welding for making it happen with snowmaking relocations. 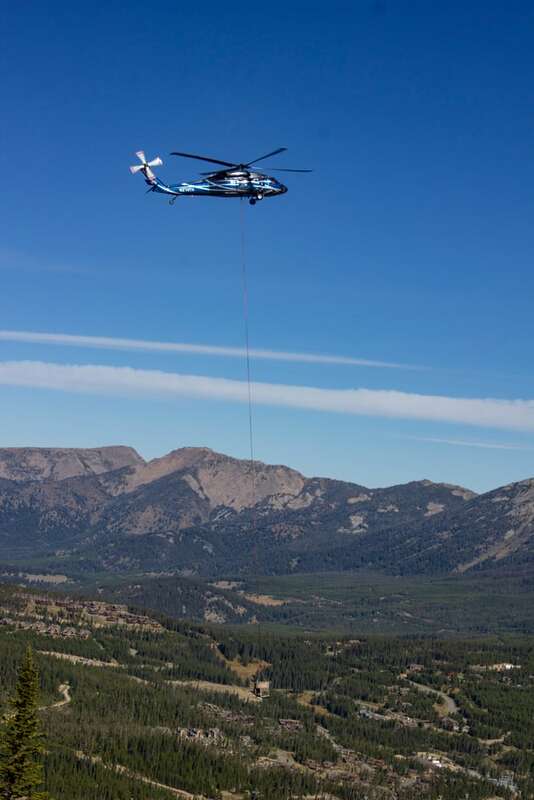 Cody Lux and Corey Northwest Energy and Rocky Mountain Contractors for all of the on mountain power distribution work. Jeremy Olsen from Gaston engineering for survey and site planning work. CTA architects and engineers for design and engineering help. Brian Wheeler for all of his help with planning, permitting, and behind the scenes work. Marin Palmer, Mountain Operations, for managing all of the billing, rental equipment agreements, insurance, budget updates, etc. Lastly, the families and friends of everyone involved who supported these individuals and teams in their dedication to the project. 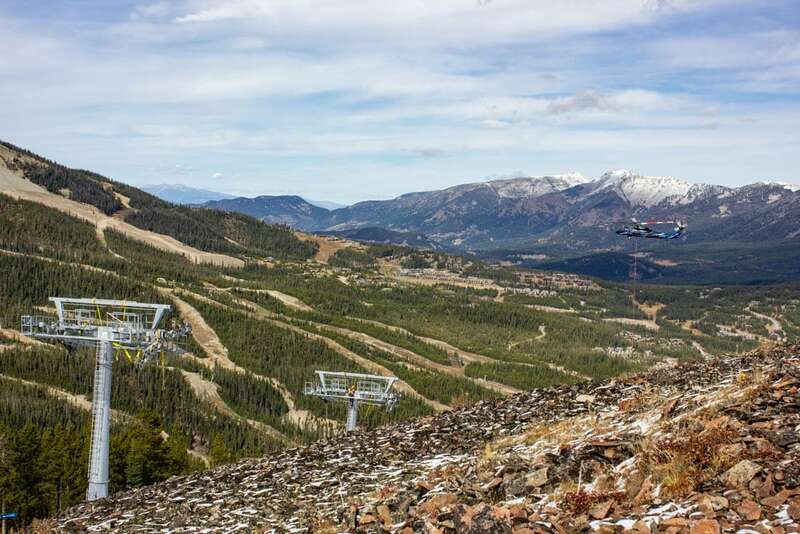 On December 15, 2018, at approximately 10:30 a.m., Ramcharger 8, the first eight-seat chairlift in North America and the most technologically-advanced chairlift in the world, debuted at Big Sky Resort. 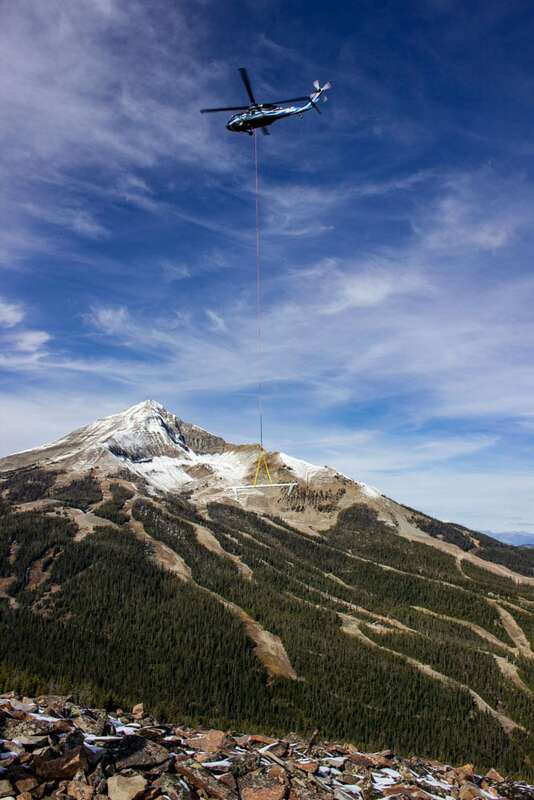 "The upgrades unveiled today at Big Sky Resort mark a new age of lift technology in major zones of the mountain," says Taylor Middleton, president and general manager of Big Sky Resort. 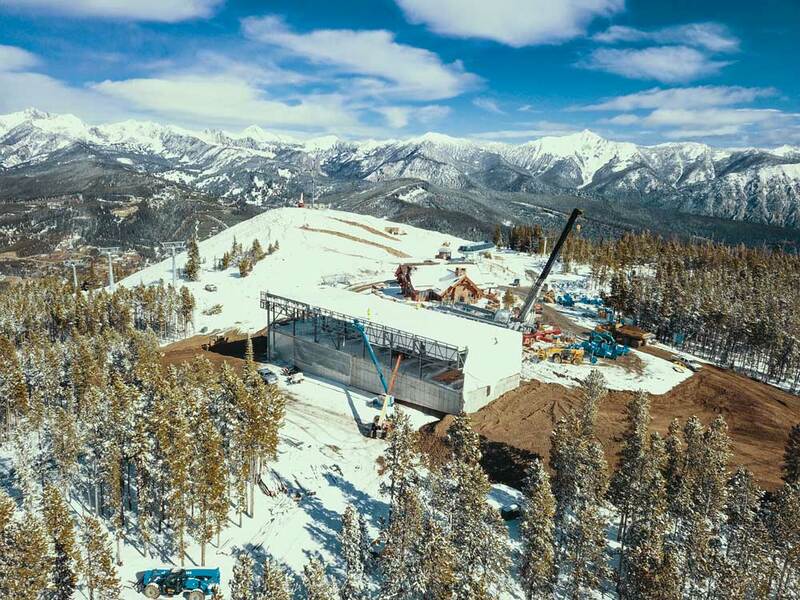 "Doppelmayr and Boyne Resorts have been collaborating for over 40 years, and together have introduced many firsts to the ski industry," says Stephen Kircher, president, Boyne Resorts. Boyne Resorts' history of innovation in the ski industry includes introducing the world's first triple and quad chairlifts and America's first high-speed six-place chairlift. 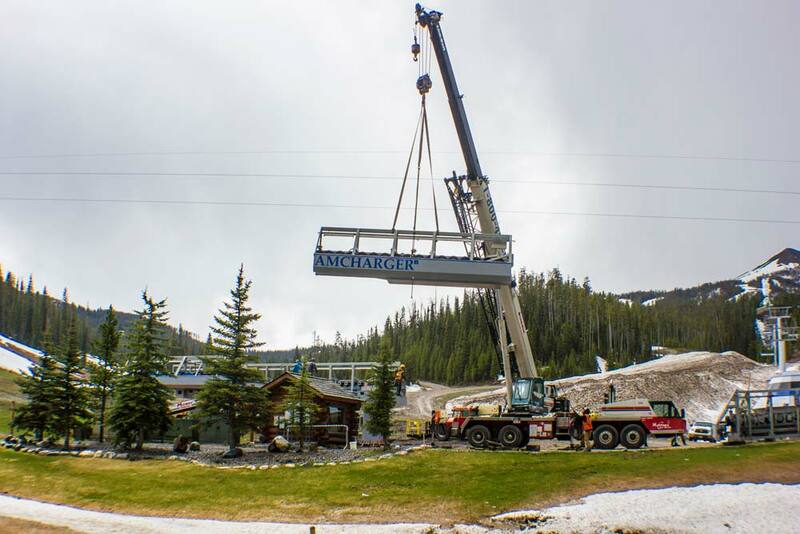 Ramcharger 8's installation marks the fifth historic chairlift upgrade for Boyne Resorts. 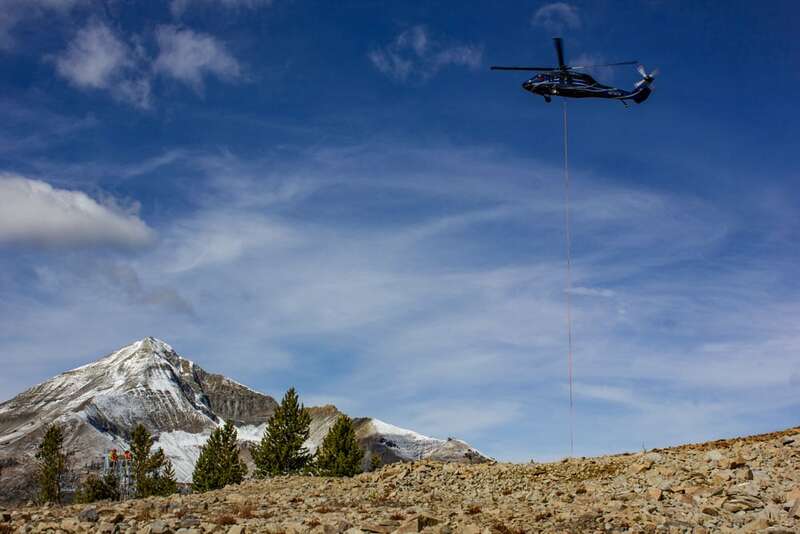 "We are incredibly proud to bring the first eight-seat chairlift to North America, setting a new standard for lift technology in the world," says Kircher. 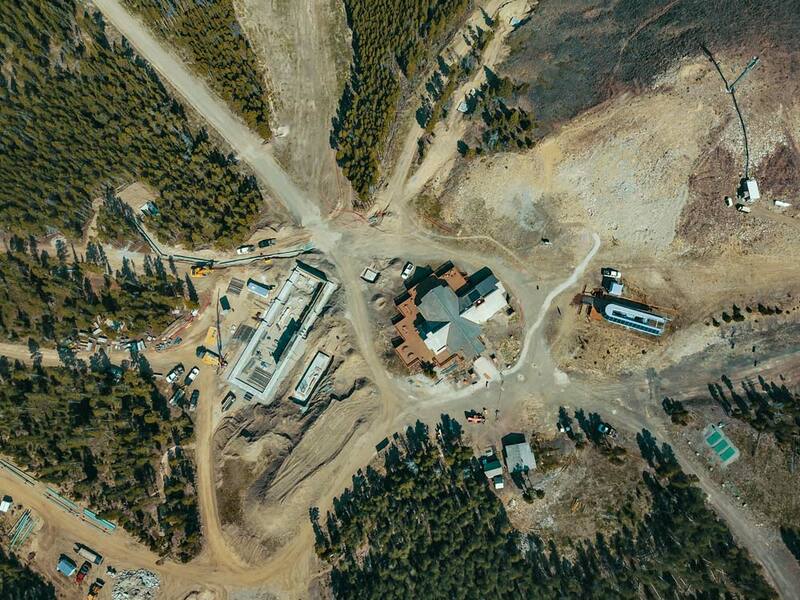 At the base of Big Sky Resort, Ramcharger 8, the new eight-seat, Direct Drive, D-line chairlift, significantly improves the guest experience on Andesite Mountain, and paves the way for future on-mountain upgrades in that area. Guests will experience a whisper-quiet ride and incomparable comfort, benefiting from ergonomically-shaped, extra-wide heated seats, a weather-proof Big Sky Blue Bubble, and adjustable loading carpet. "Ramcharger 8 is the culmination of everything we have learned so far, and incorporates many firsts for the North American market; first eight-passenger chairlift, first direct drive motor, first locking restraint bar, first height-adjustable loading carpet, first high resolution video display, and the first of our newest generation detachable lifts, the D-Line, says Mark Bee, president, Doppelmayr USA. 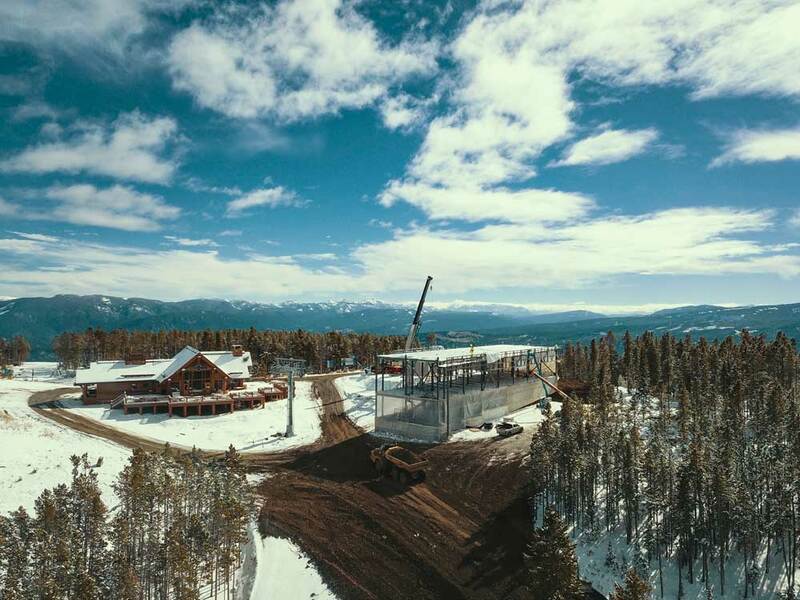 "We look forward to continuing to work with Boyne Resorts and Big Sky as they execute the Big Sky 2025 vision," says Bee. 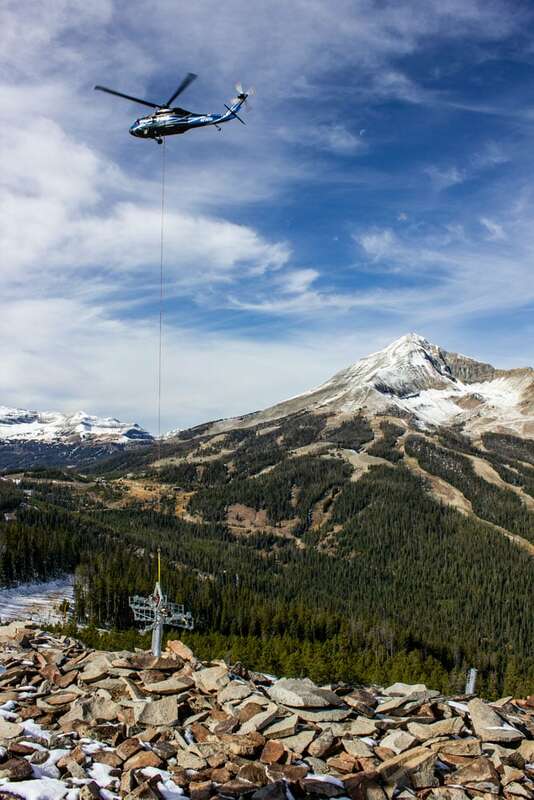 Ramcharger 8 whisks up to 3,200 skiers up Andesite Mountain each hour. 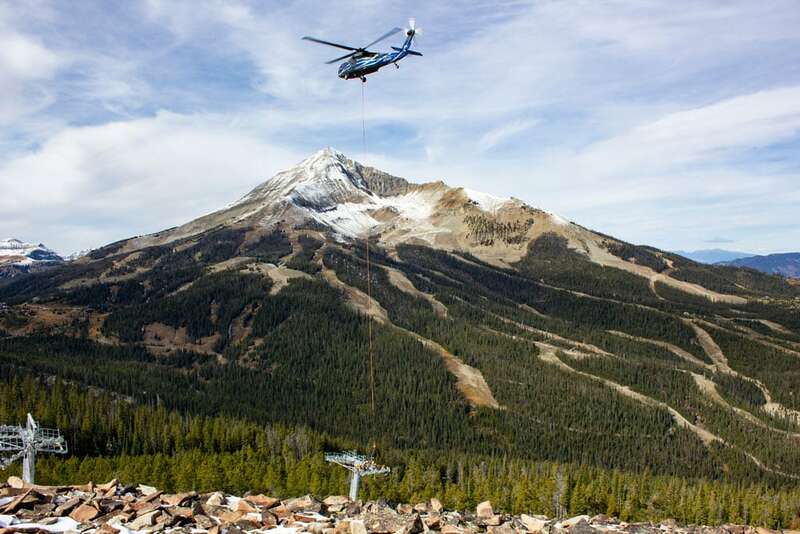 Improvements to Ramcharger 8 provide more comfortable access to Everett's 8800, Big Sky Resort's mountain-top fine dining experience featuring American alpine fare. This season, savor spectacular views at Everett's 8800 during First Tracks breakfast, lunch and dinner service daily. 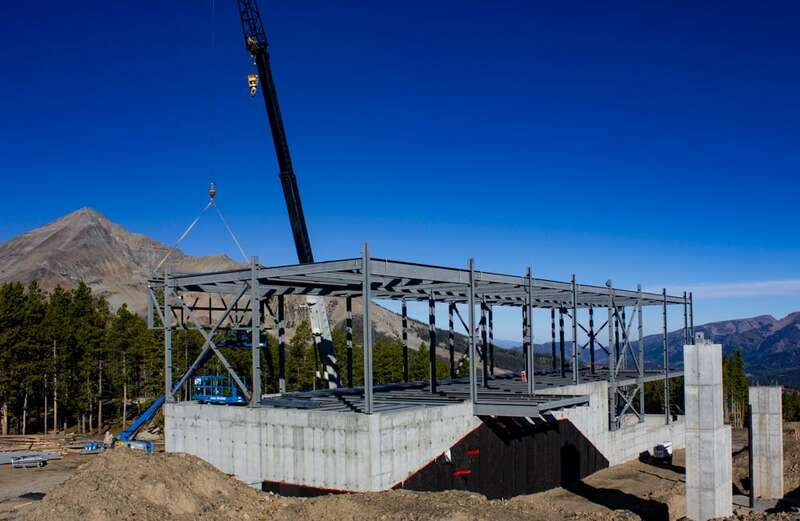 Following Ramcharger 8's upgrade, Big Sky Resort plans to introduce inventive, new experiences for future ski seasons. 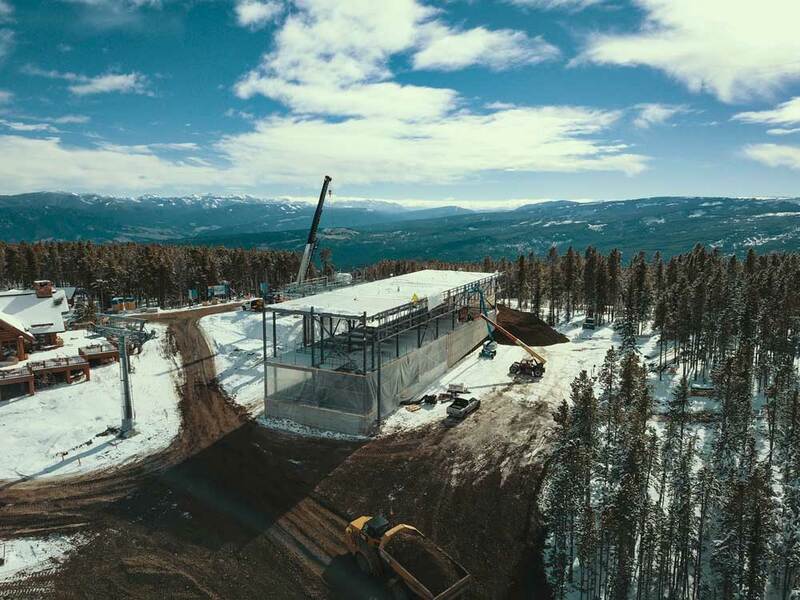 In the 2019-2020 winter season, Big Sky Resort will add three Omega V gondola cabins to Ramcharger 8. Two will be dedicated Dining Cars, allowing guests to sit around a table installed in the cabin for a premier dining experience. 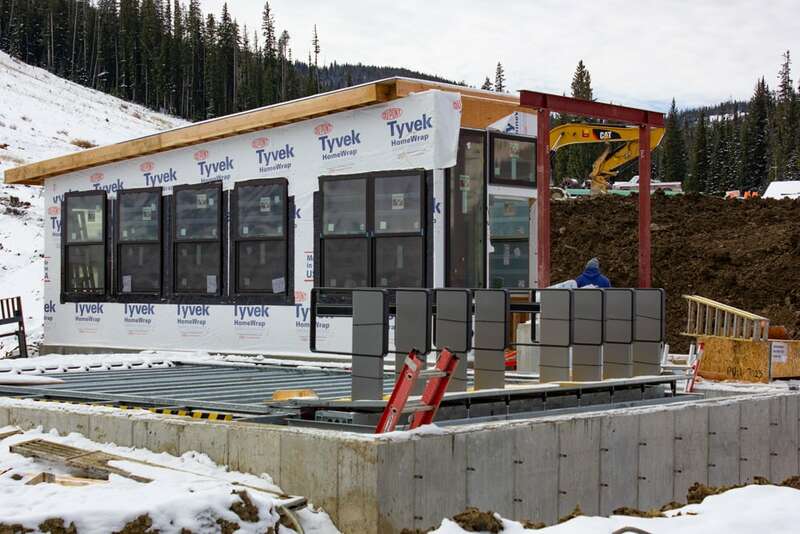 "With the addition of the Omega V dining cars, Big Sky will be home to the smallest restaurant in North America," says Kircher. Another car will be reserved as a VIP cabin. 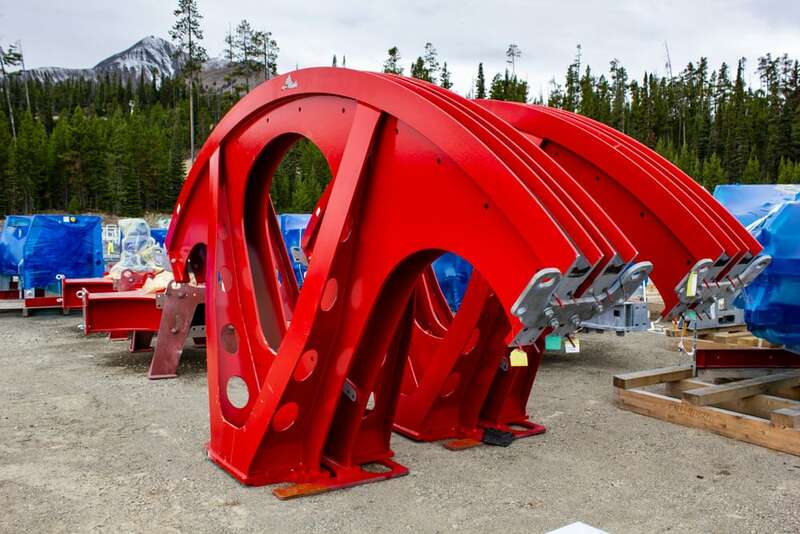 The Omega V gondola cabins will be the first of their kind to debut in North America. 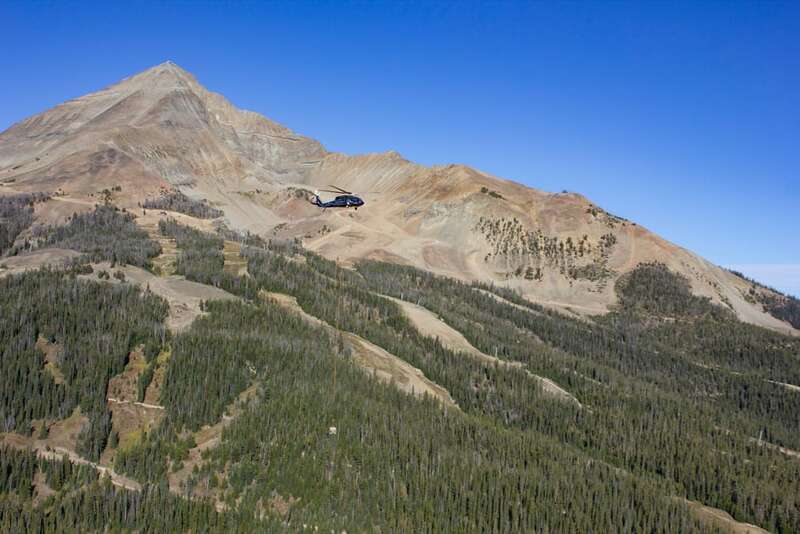 Additionally, Big Sky Resort plans to add a night skiing experience on Andesite Mountain, serviced by Ramcharger 8. The moment we've all been waiting for is nearly here. 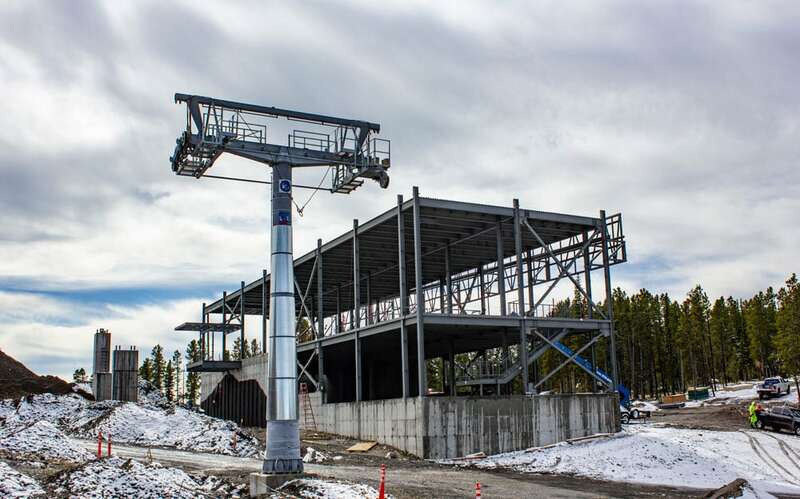 Ramcharger 8, North America's first high-speed eight-seat chairlift, will open to the public this Saturday, December 15, 2018. 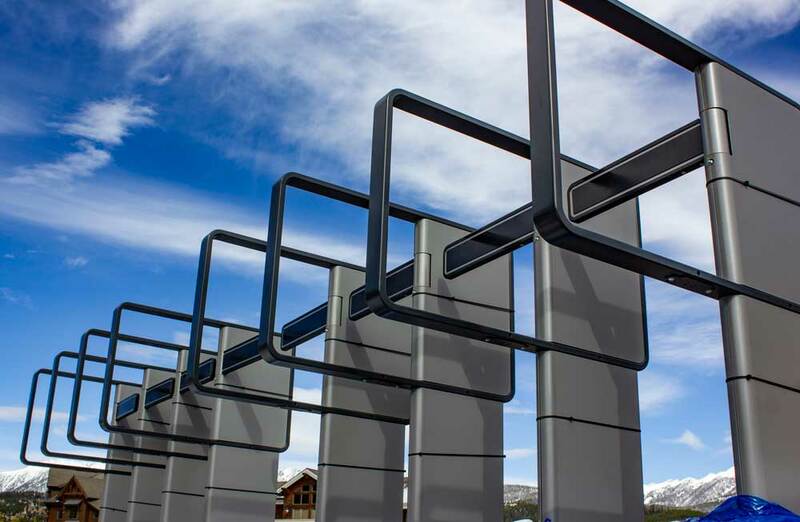 Join Stephen Kircher, president of Boyne Resorts, Taylor Middleton, general manager and president of Big Sky Resort, Doppelmayr, and the Big Sky Mountain Ops team at a ribbon cutting ceremony at the bottom terminal of Ramcharger 8 at 10am. The lift will open to the public at 11am. The first 8-seat chair has officially traveled on a haul rope in North America. Yesterday, a Ramcharger 8 chair was sent down the haul rope to check alignment, electrical systems, and Direct Drive technology. The electrical wiring and commissioning process continues, which includes engaging the Direct Drive and moving chairs. 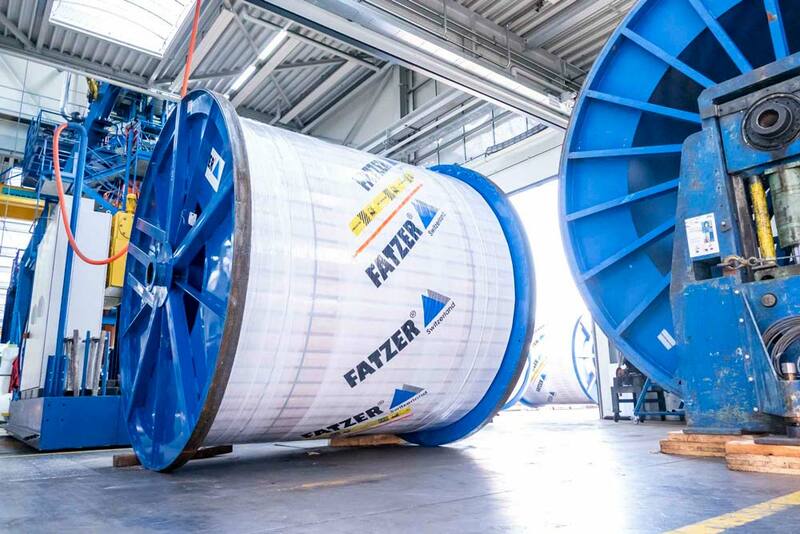 A Doppelmayr team from Austria will assist in computer programming, the next step in the construction process. Ramcharger 8's massive LED screen has been installed in the bottom terminal of the lift. The LED screen was installed by linking together 40 individual screens. Over the course of the season, Ramcharger 8's LED screen will feature videos, user-generated content, and up-to-the-minute weather conditions. 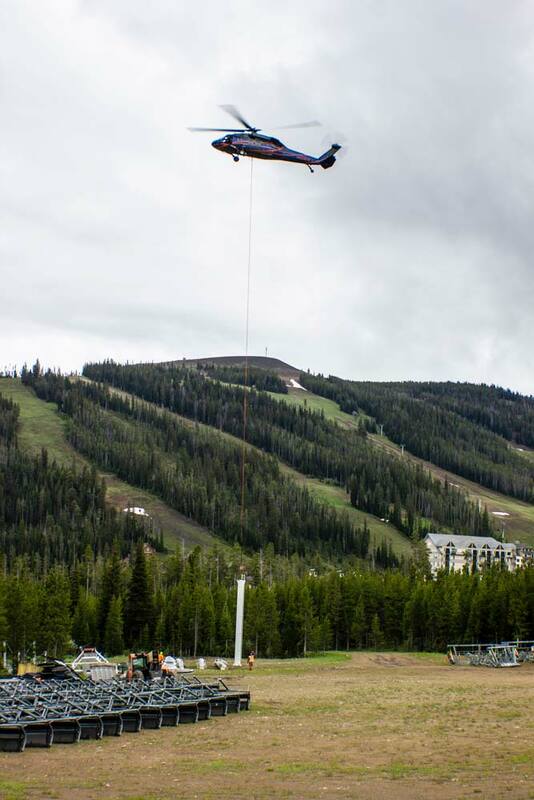 It's been a busy couple weeks here at Big Sky Resort. 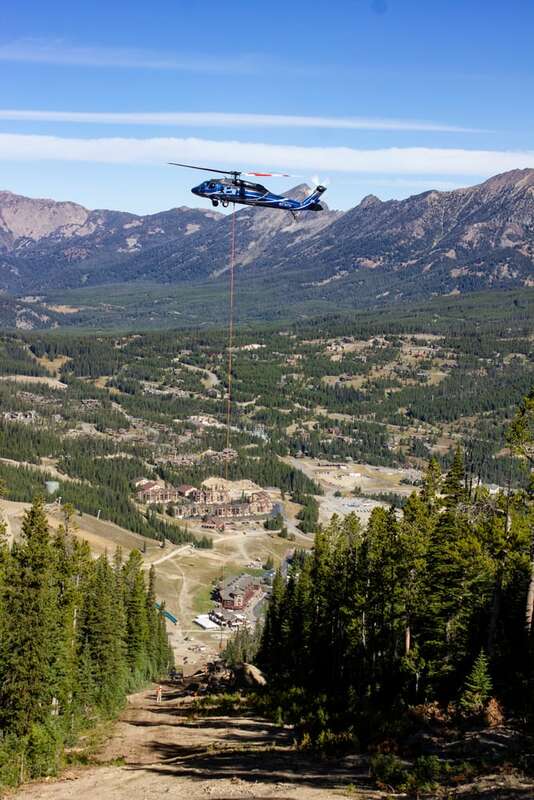 This morning at 8 a.m., a crew of 40 team members from Big Sky Resort, Doppelmayr, and Fatzer ropes worked together in perfect unison to splice the haul rope. 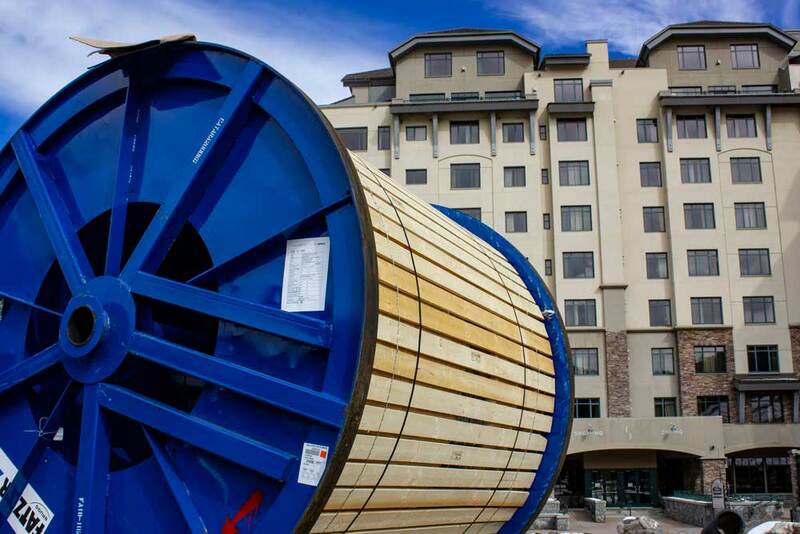 The term "haul rope" is used for the wire rope, or cable, as many skiers refer to it. 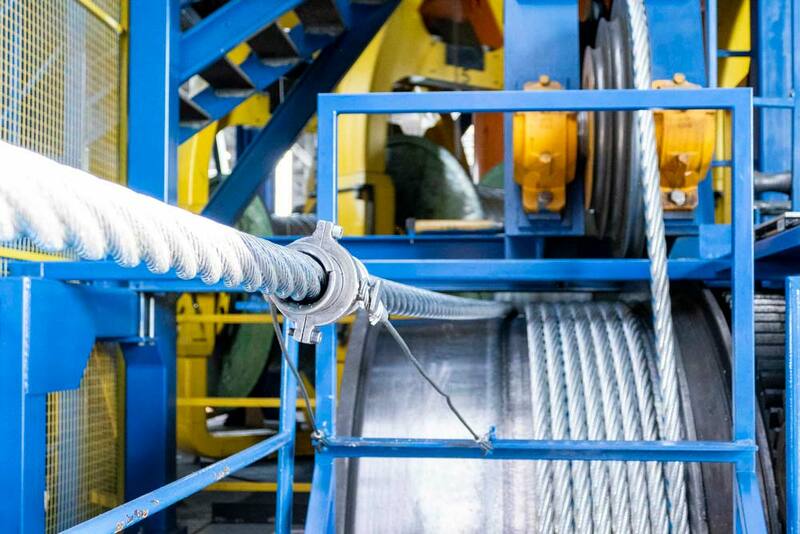 As the haul rope is spliced, the rope is essentially held together by tension and friction. The total weigh of the haul rope on the spool was 78,000 pounds. The haul rope splice is expected to be completed ahead of schedule. Once the haul rope is on the lower bullwheel, the next step is double checking alignment in the terminals and on each tower. Simultaneously, crews are finishing up wiring, chair assembly, and terminal assembly. Additionally, in the chair barn at the top of Ramcharger 8, nearly all of the chairs have been hung on the parking rails. It's hard to comprehend how truly massive these chairs are - each more than 15 feet wide and weighing over a ton. If a quad chair is a sedan, Ramcharger's 8-seater is the stretch limo of chairlifts. For scale, we put one person on the chair to show you just how much elbow room the chairlift provides. Finally, Big Sky Resort is at the Denver Expo ski show this weekend - stop by our booth to be one of the first to see a Ramcharger 8 chair in person. 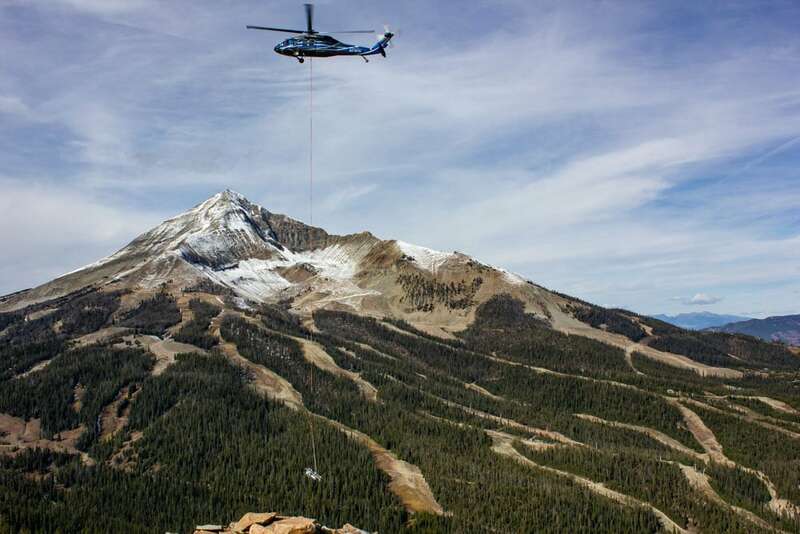 Crews from Big Sky Mountain Ops and Doppelmayr pulled the first of two sand lines earlier this week, in preparation to install the haul rope. Due to the size and weight of Ramcharger's haul rope, the first sand line will pull a larger, strong sand line before pulling the final haul rope. Set up for splicing of the haul rope is expected to occur later this week. 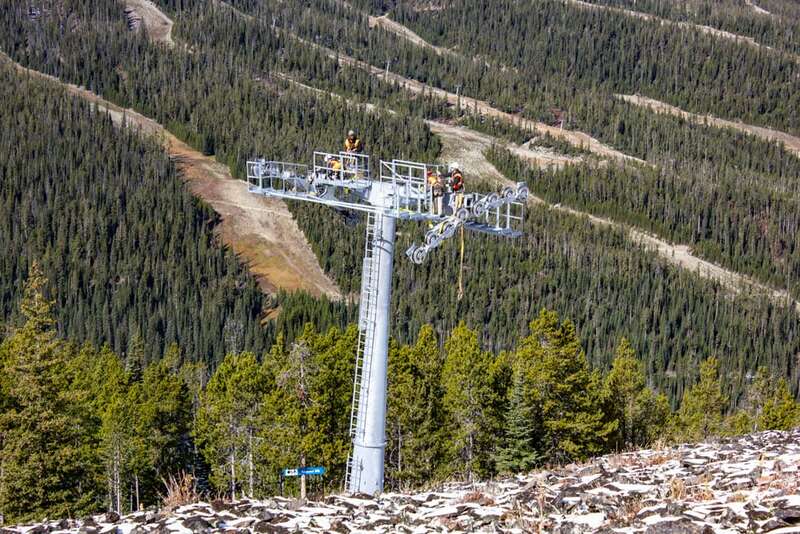 Ramcharger's LED screen will be installed on the bottom terminal of the lift over the three days just before Thanksgiving. Installation of the screen will be very precise, with 40 separate panels linking together to create one massive screen. 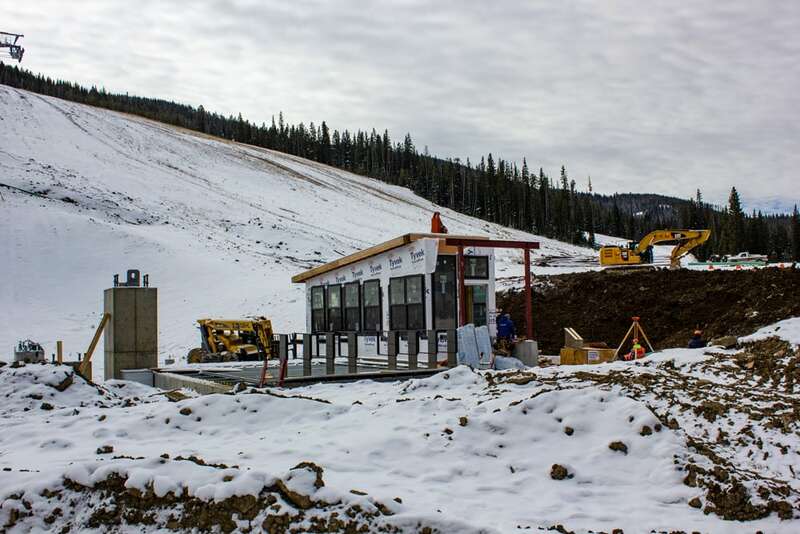 The Ramcharger 8 chairlift remains on schedule for a mid-December launch date. 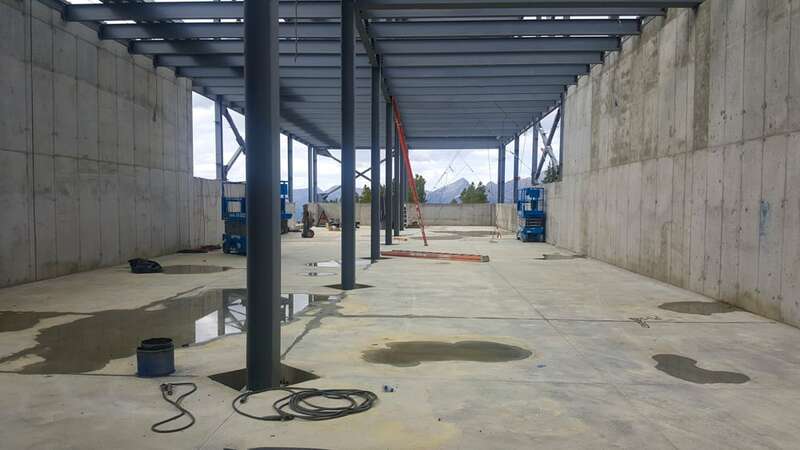 The bottom terminal of Ramcharger 8 is currently under construction. A crane is used to erect the bottom terminal. The next major milestone of Ramcharger 8 construction is installing and splicing the haul rope into one continuous loop. 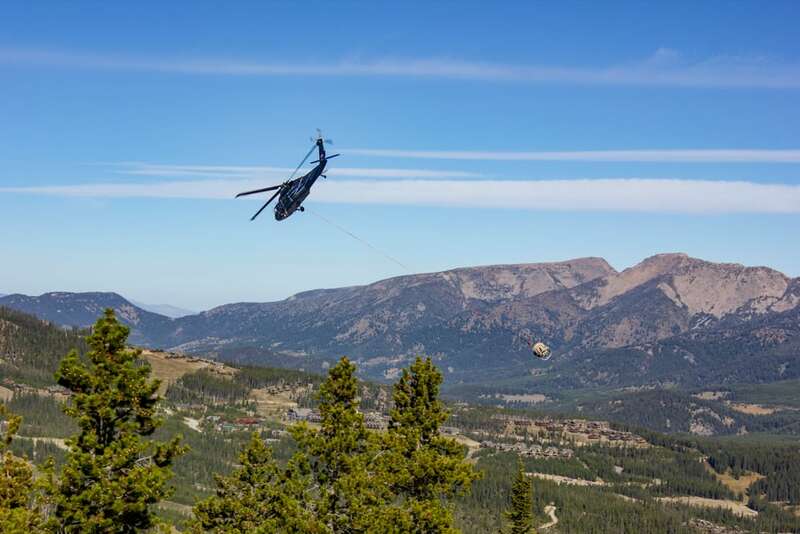 The term "haul rope" is used for the wire rope, or cable, as many skiers refer to it. Chairs attach and detach from this rope at both ends of the lift. 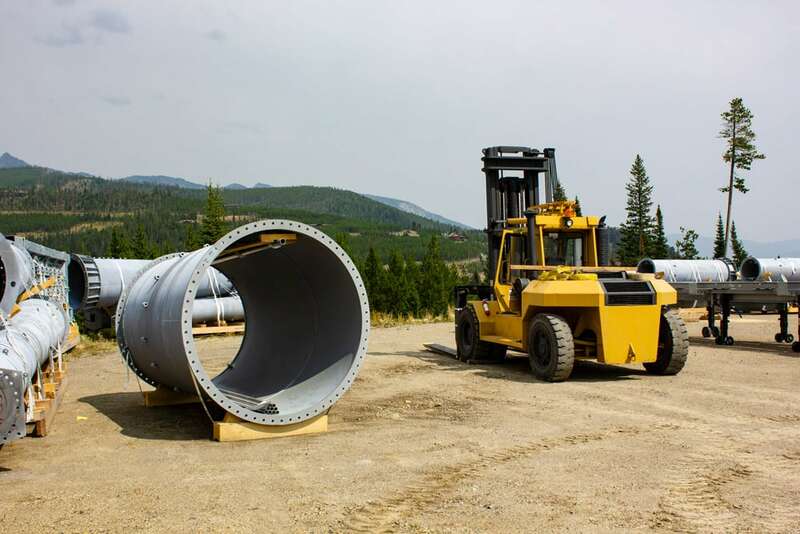 This allows for easier loading and unloading as the haul rope continues to move at a speed of 11+ miles per hour. 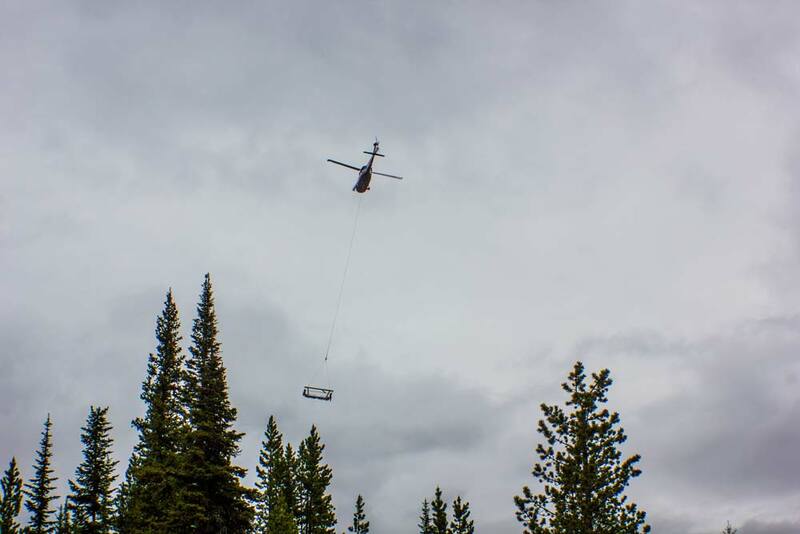 The remaining Ramcharger 8 chairs are scheduled to arrive by the end of the week. 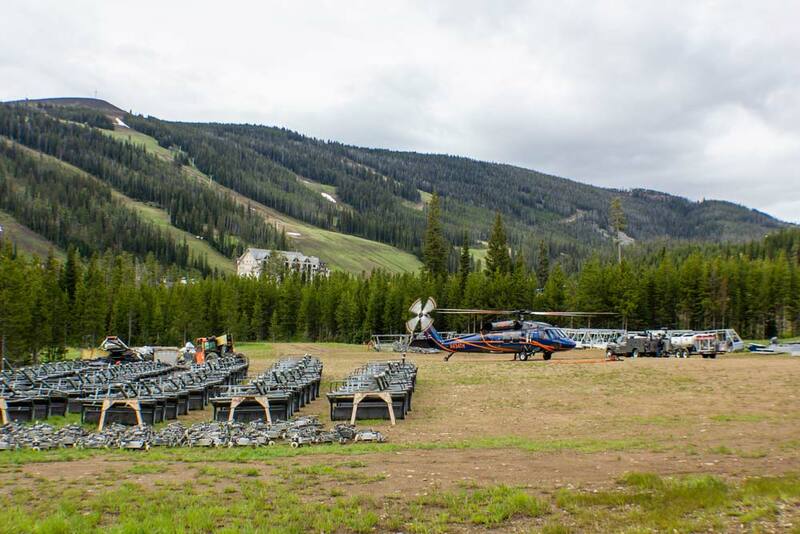 Yesterday, the first four Ramcharger 8 chairs were delivered to Big Sky Resort. Within the next few days, 60 more chairs will arrive. 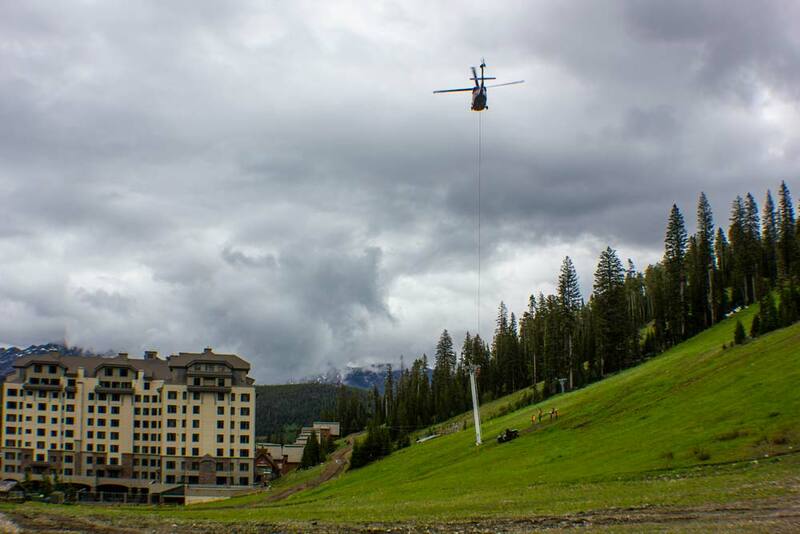 It may be October, but it feels like Christmas morning at Big Sky Resort - we can't wait to unwrap them. 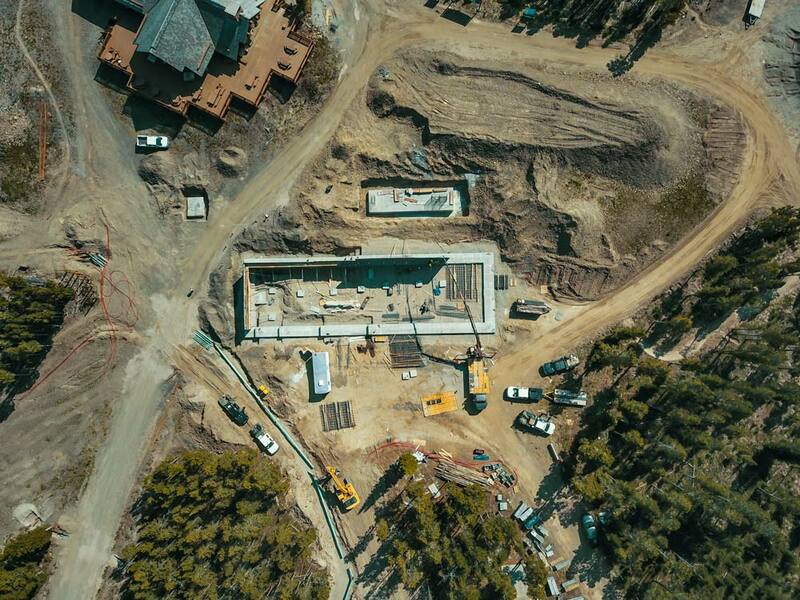 View a time lapse of early efforts to construct Ramcharger 8, a brand new eight-seat, high-speed D-line chairlift coming to Big Sky Resort in December 2018. 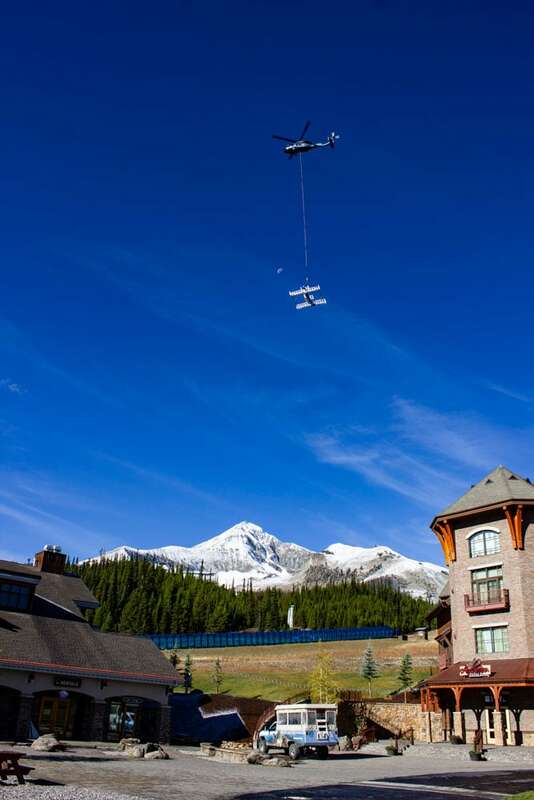 This lift will be the first of its kind in the world and the most technologically advanced lift ever built. 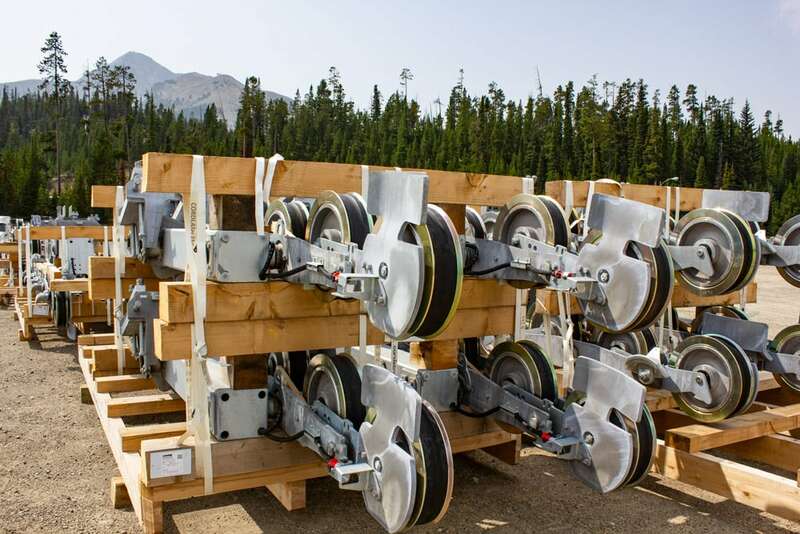 New Ramcharger 8 chairs have arrived to the Tacoma, WA port and are in transit by truck to Big Sky Resort. Twenty-two trucks will be delivering 64 chairs. Each chair is approximately 15 feet wide by 13 feet tall, and weighs 2262 pounds -- roughly the equivalent of 4 adult male grizzly bears. The bubble on each chair is 4.19 feet deep from front to back at its widest point. Each grip weighs approximately 350 pounds. Ramcharger 8’s Direct Drive and back-up motor are now in place. The bull wheel measures 24.28 feet in diameter – more than two stories tall. 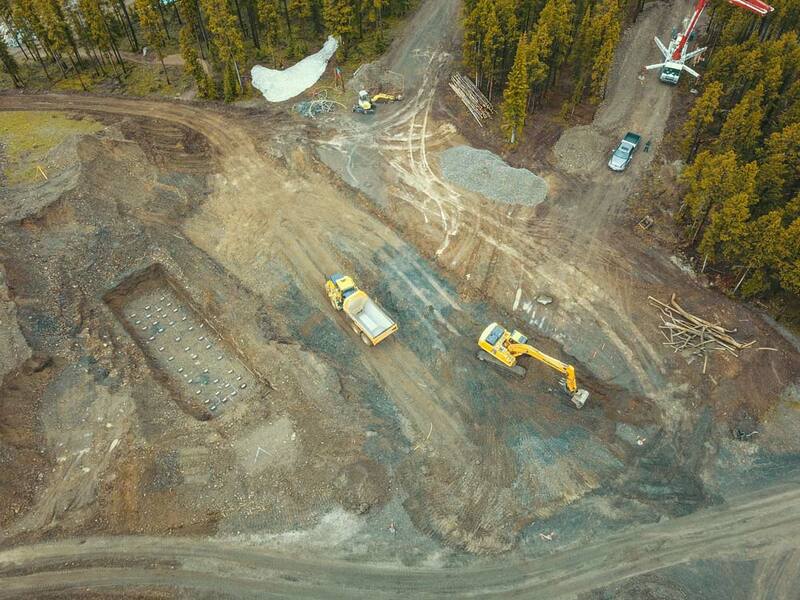 Teams are now finishing up grade work at the bottom of Ramcharger 8. 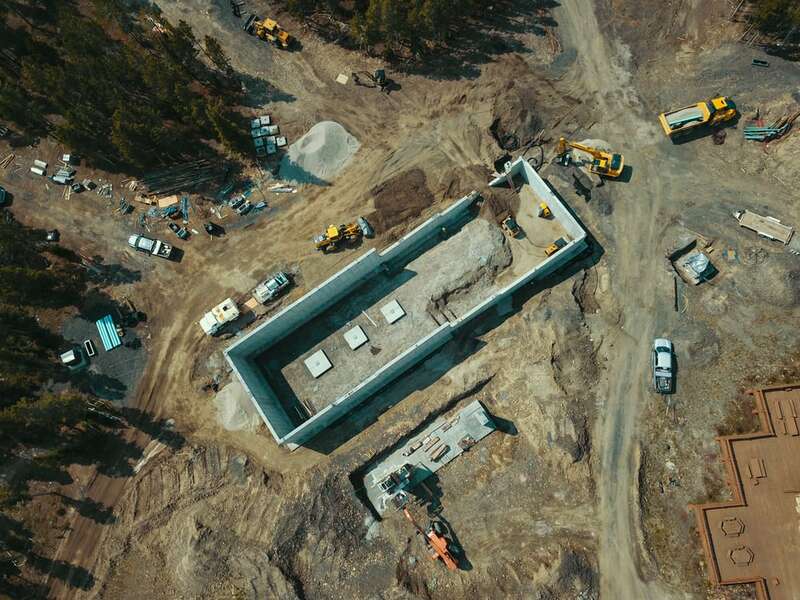 To this point, teams have moved more than 50,000 cubic yards of dirt for the new lift construction, which is more than 15 Olympic-sized swimming pools worth of material. 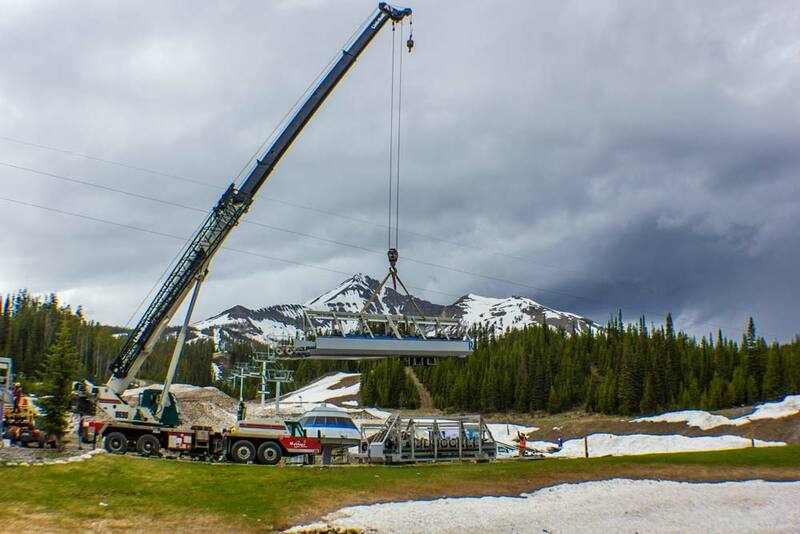 Big Sky Resort’s commitment to delivering a world-class mountain experience and the most technologically-advanced chairlift network in North America won’t end with upgrades to Ramcharger 8 and Shedhorn. 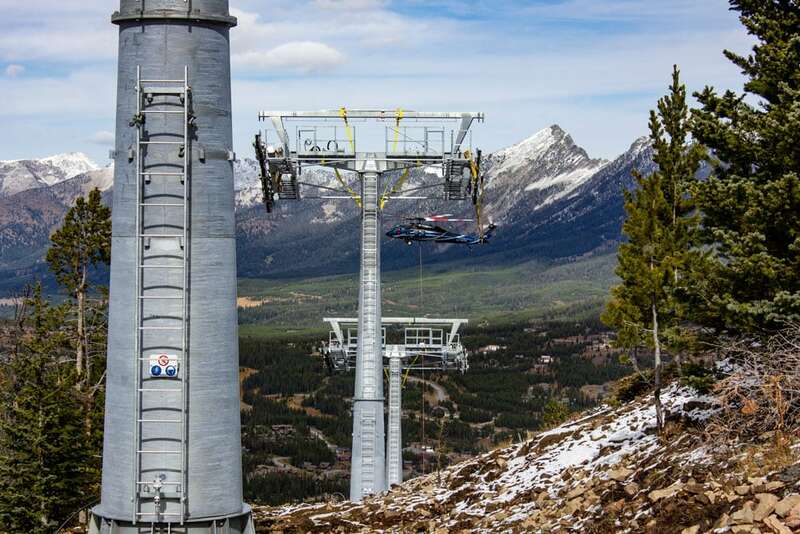 Long-term plans for capital improvements, detailed in the Big Sky 2025 vision, include upgrades to the Swift Current lift from a high-speed quad to the latest and most appropriate capacity lift. 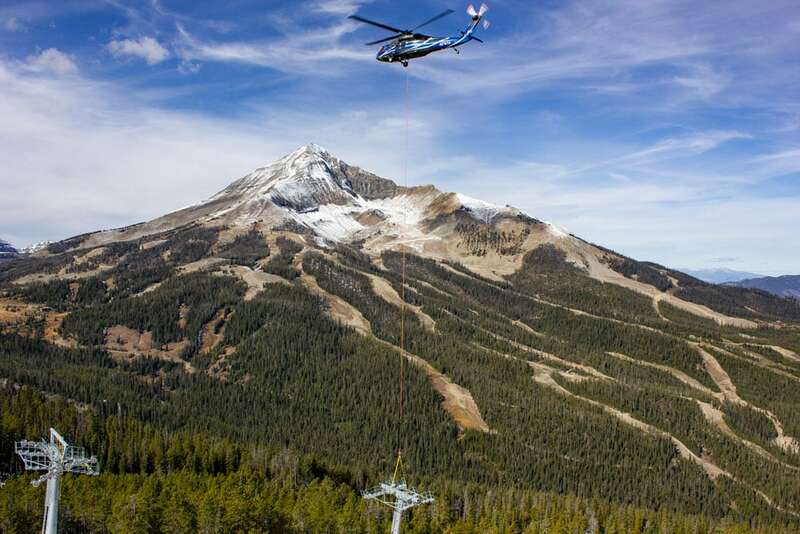 Ultimately, the existing Swift Current chair is planned to be relocated to the Moonlight side of Big Sky Resort to support terrain expansion efforts in that area. 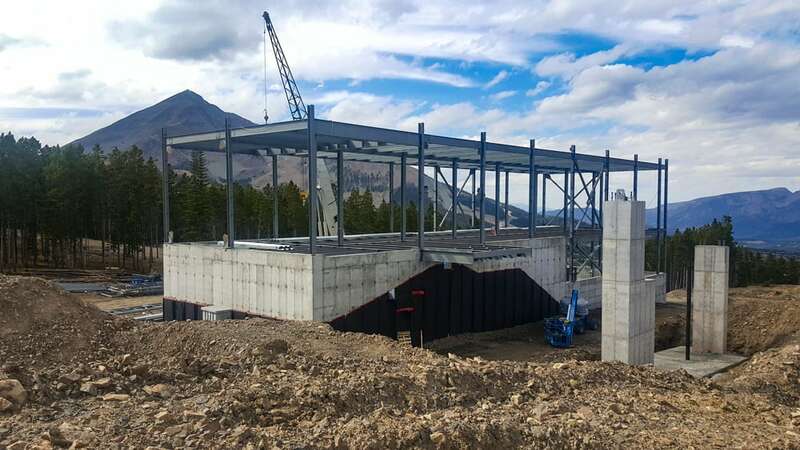 Planned improvements also include the transformation of the Explorer lift experience from a double lift to a gondola extending to the Bowl to further improve skier access from the Mountain Village base area. 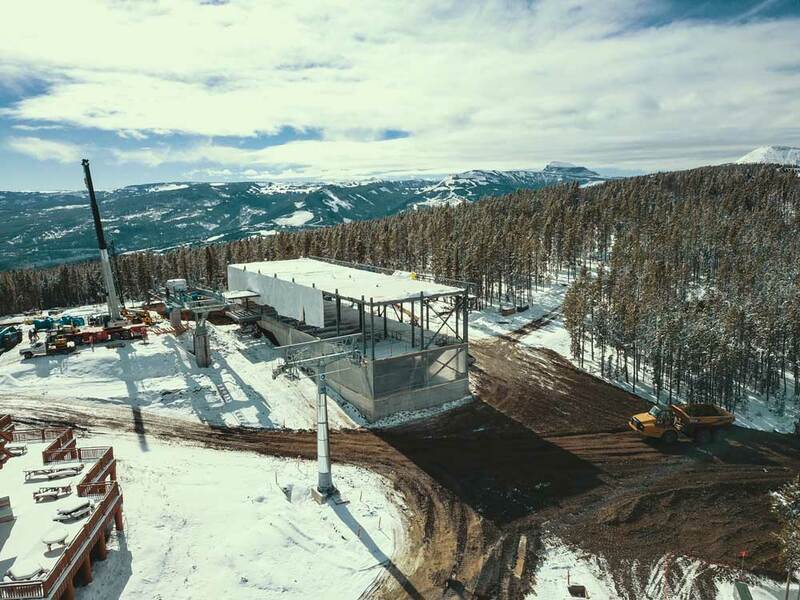 The lift house, located at the bottom terminal of Ramcharger 8, has been constructed. 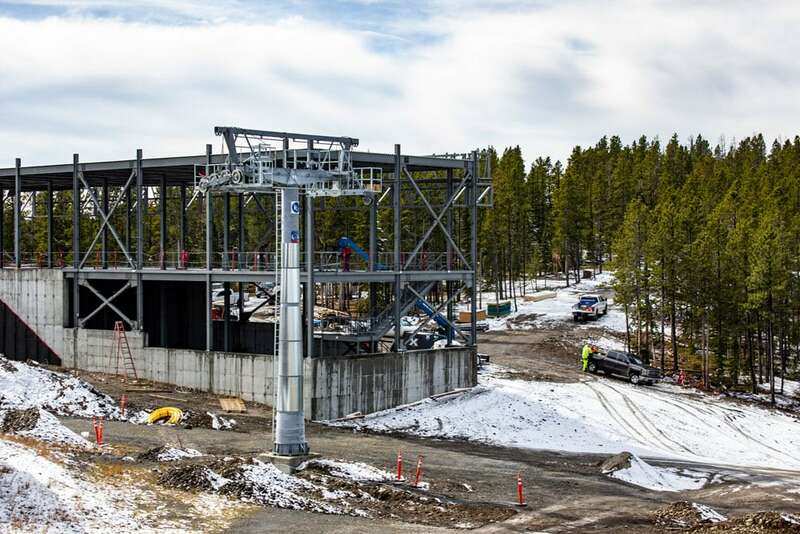 The lift house is home to Ramcharger 8's control panels and other various electronics, which will be operated by a trained lift operator. 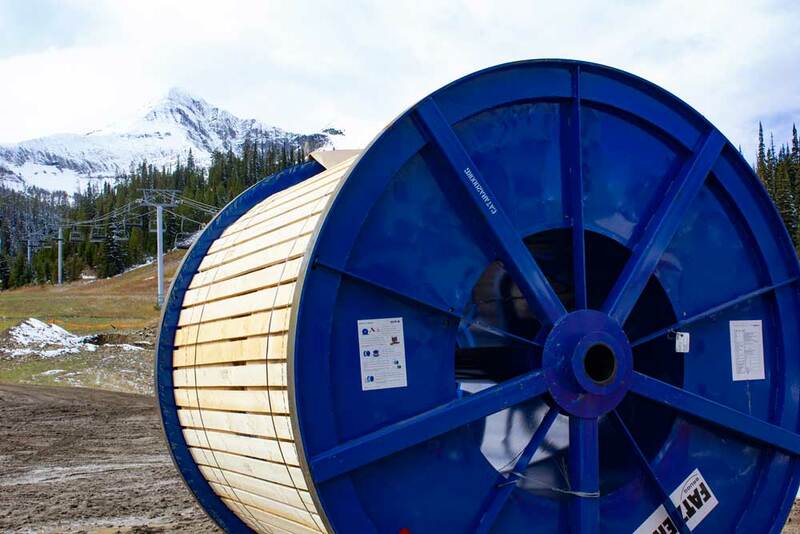 The control system on the lift is the latest version by Doppelmayr, referred to as "Doppelmayr Connect." 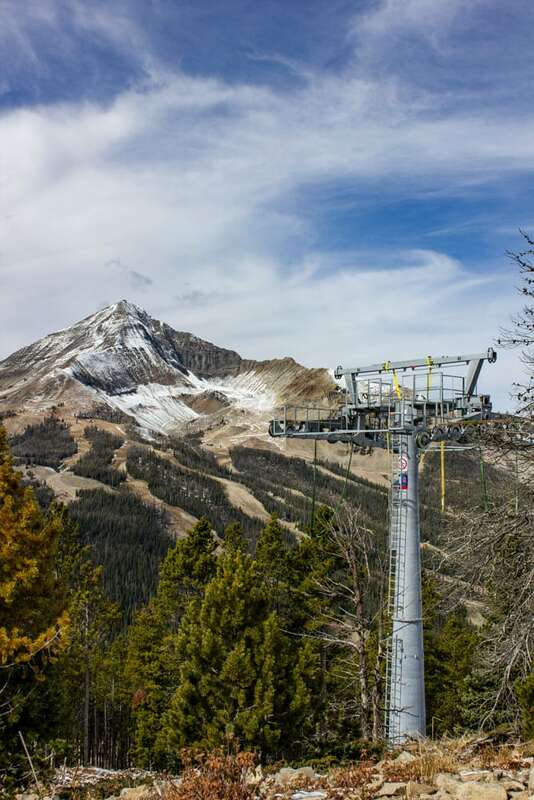 This system includes a remote stop button that is worn by the lift operator, so the stop button travels with the lift operator when the chairlift is in operation. Also pictured are the loading gates - eight in total - to assist with traffic flow as guests enter the loading carpet to the lift. The Ramcharger 8 haul rope spindle arrived late last night and was put into a staging area today. The spindle weighs approximately 78,000 pounds, or around the weight of 7 adult male elephants. 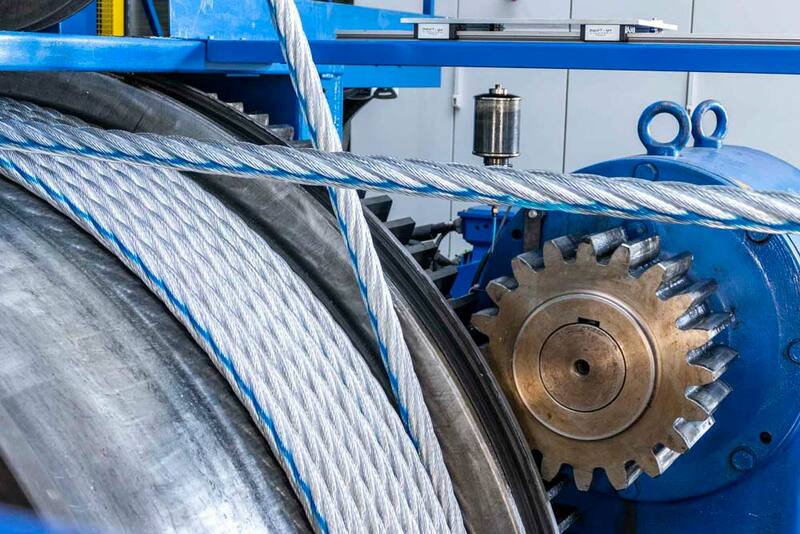 This haul rope will be spliced using Dopplemayr's TRUsplice technology. 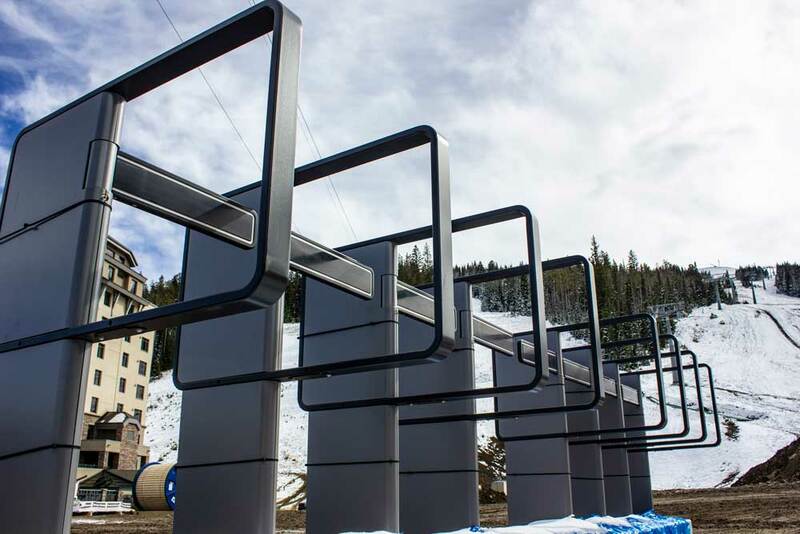 The lift gates have also arrived and been assembled. 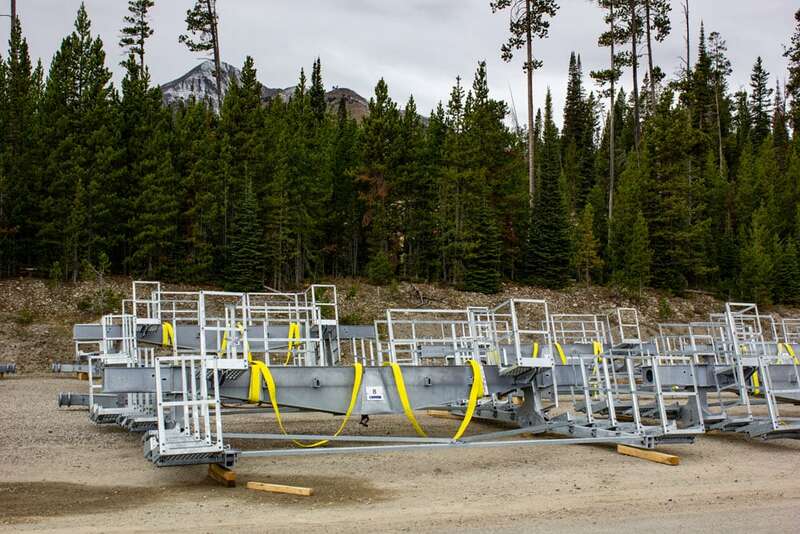 These gates will help assist skiers in knowing when to move forward onto the conveyor loading carpet, which will then transport skiers safely onto a Ramcharger 8 chair. 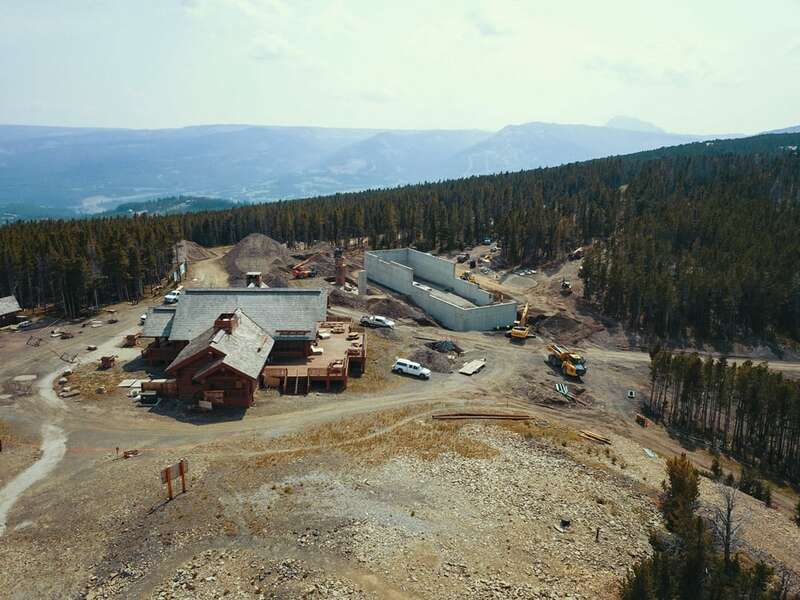 Finally, work has begun on the Ramcharger 8 chair barn's exterior. 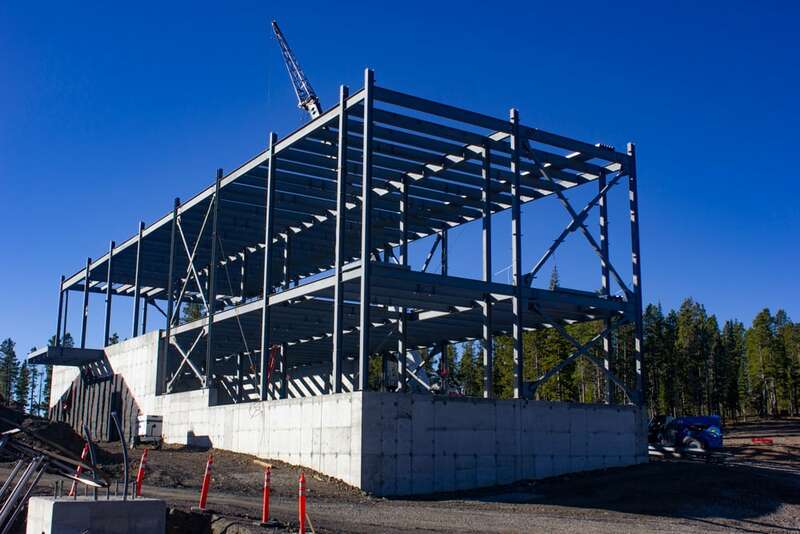 This storage building is roughly 150ft x 50ft and two stories tall, and it will store the high-tech Ramcharger 8 chairs each night to protect them from the elements. 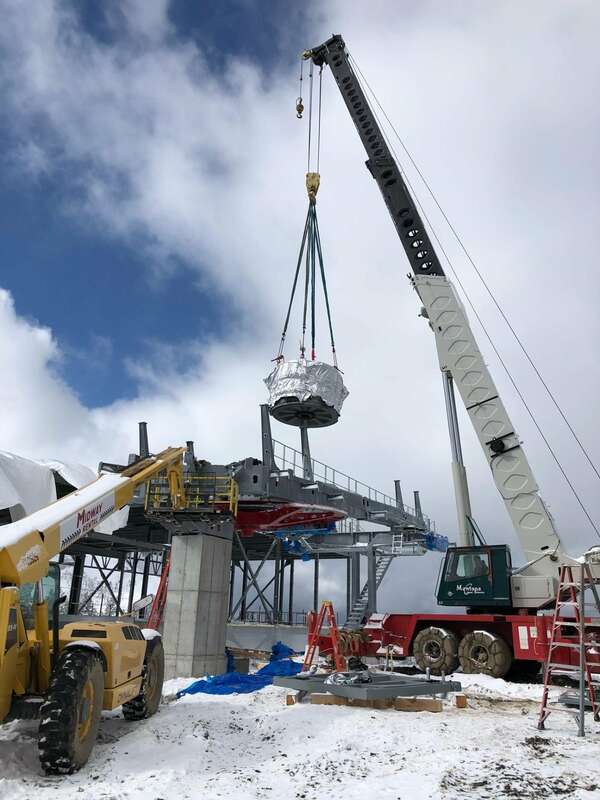 The Dopplemayr Direct Drive, or DDD, was installed in the top terminal of Ramcharger 8 today. The DDD is a whisper-quiet gearless drive, which in turn makes it energy efficient, low-vibration, and low-noise. It uses a water-cooled "hermetically sealed permanent magnet synchronous motor." Since it is water-cooled, the noise from fans is eliminated, which has a positive effect on the surrounding environment. 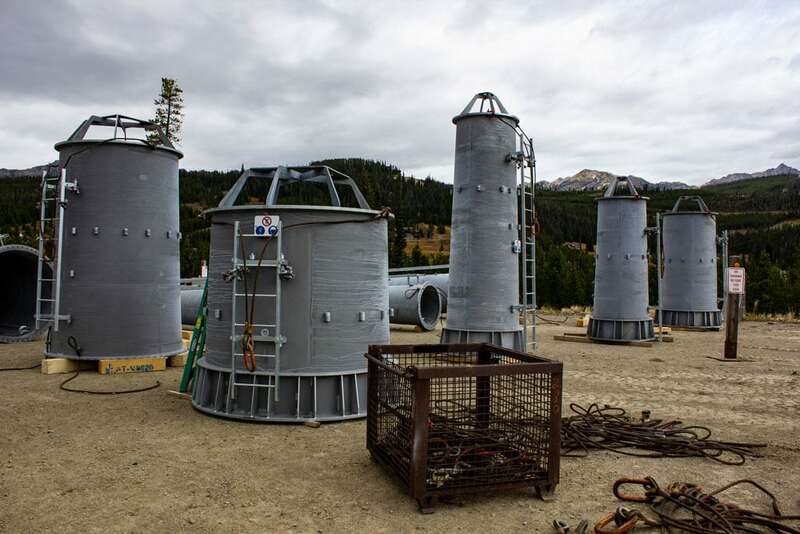 Lift towers and other equipment were flown into place today. 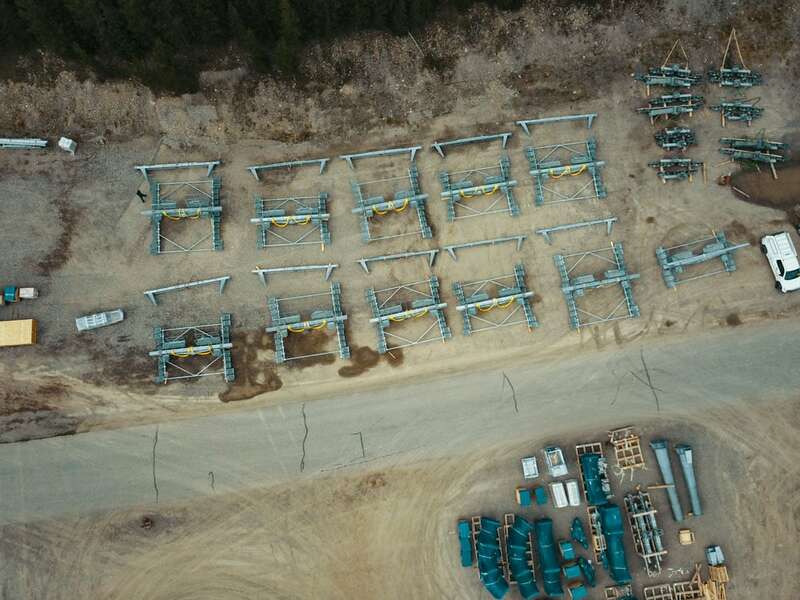 This is a significant step toward the on-time completion of the Ramcharger 8 project. 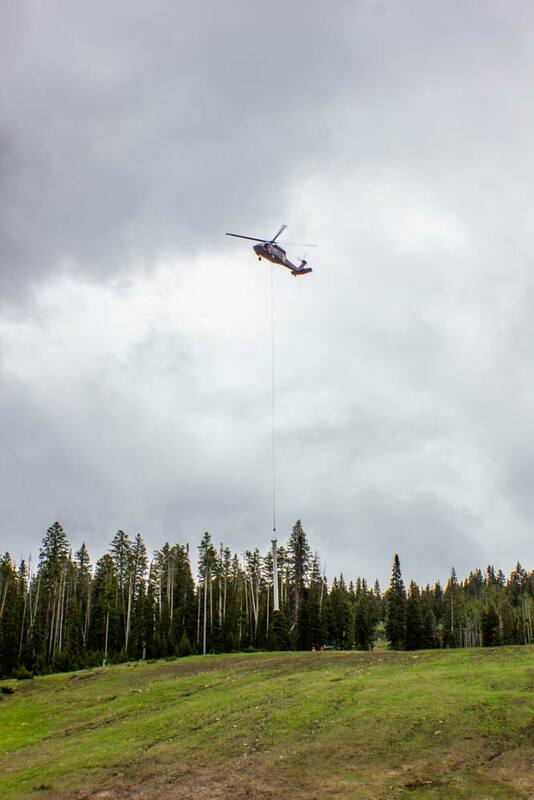 Timberline Helicopters provided the Black Hawk bird used to transport the thousands of pounds of steel to their final location on-mountain. The process took 71 passes and took about 7 hours to complete, an average of just under 6 minutes per trip. 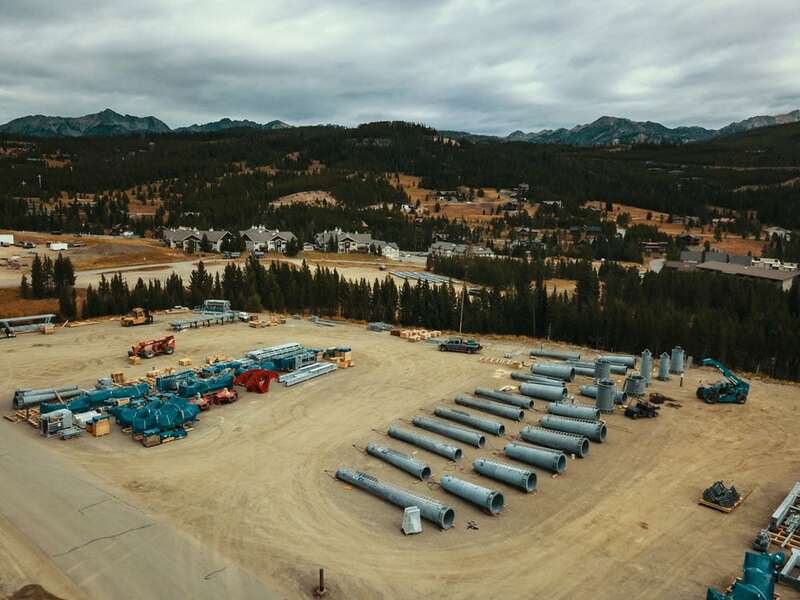 The equipment in the staging area is being prepared to fly into place this coming Monday, October 1, 2018. 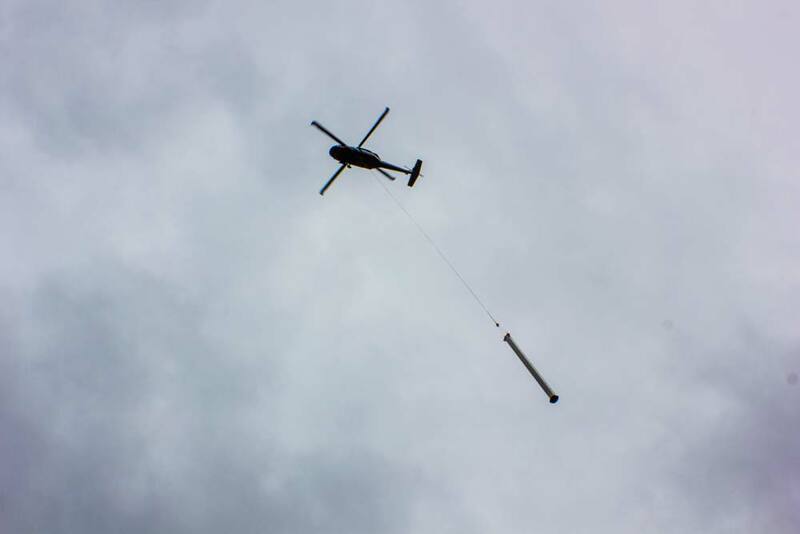 The various parts will be flown by a Black Hawk helicopter and set into place by ground crews. 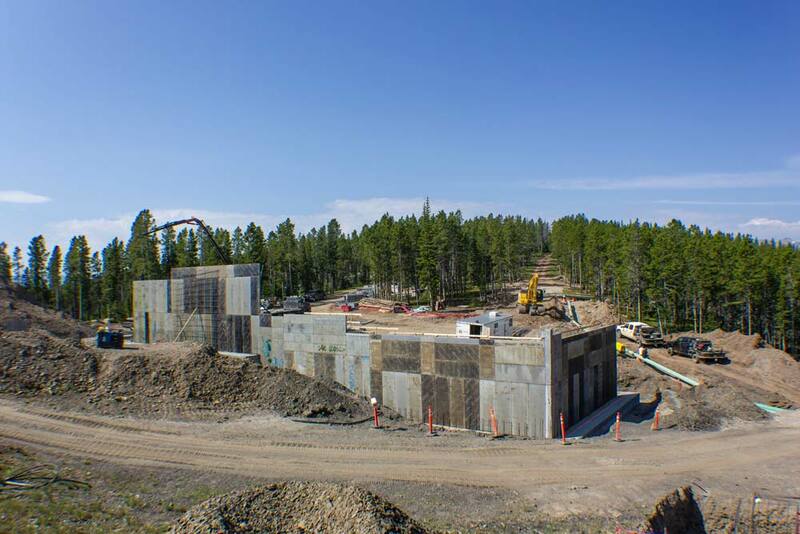 Concrete is being poured for the Ramcharger 8 lift towers. Progress has been made on the chair barn. This building is roughly 150ft x 50ft and two stories tall. It will safely store the Ramcharger 8 bubble chairs each night. Ramcharger 8's chair barn is coming along nicely. This building is roughly 150ft x 50ft and two stories tall. It will safely store the Ramcharger 8 bubble chairs each night. 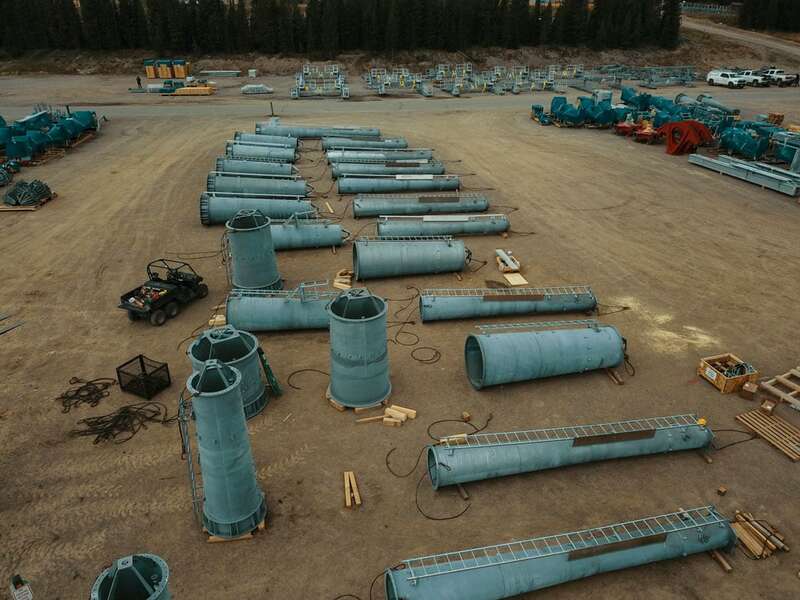 We've received our tower bases and sheave assemblies. 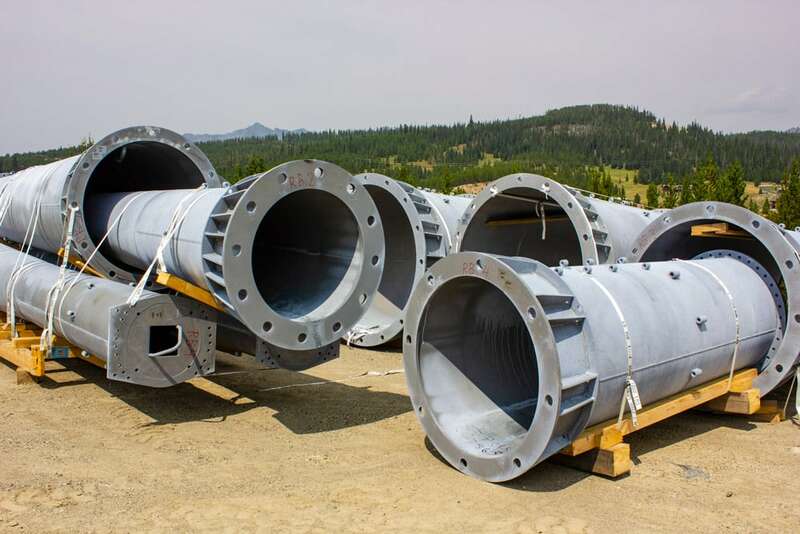 These were originally assembled in the Doppelmayr shop in Wolfurt, Austria, then shipped and delivered to the waiting yard at Big Sky Resort. 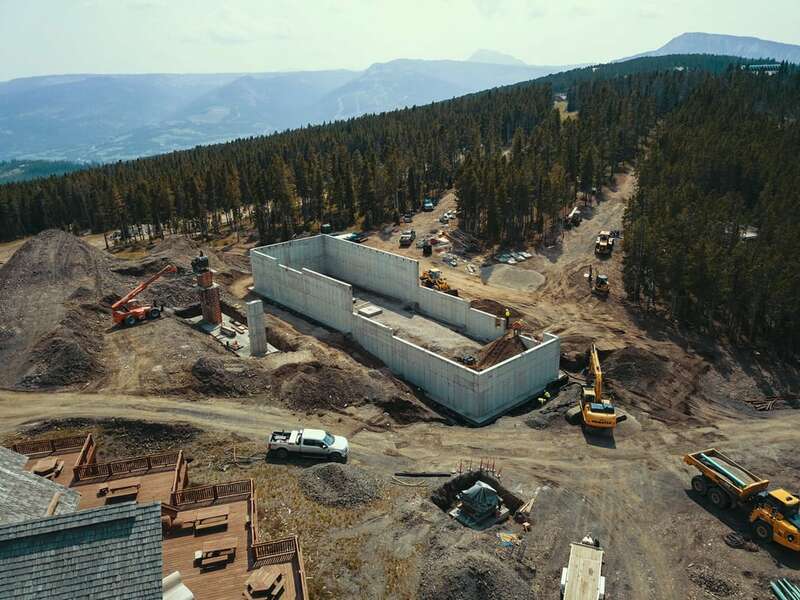 Additionally, more progress has been made on the Ramcharger 8 chair barn with the concrete walls now being poured. This building is roughly 150ft x 50ft and two stories tall. It will safely store the Ramcharger 8 bubble chairs each night. 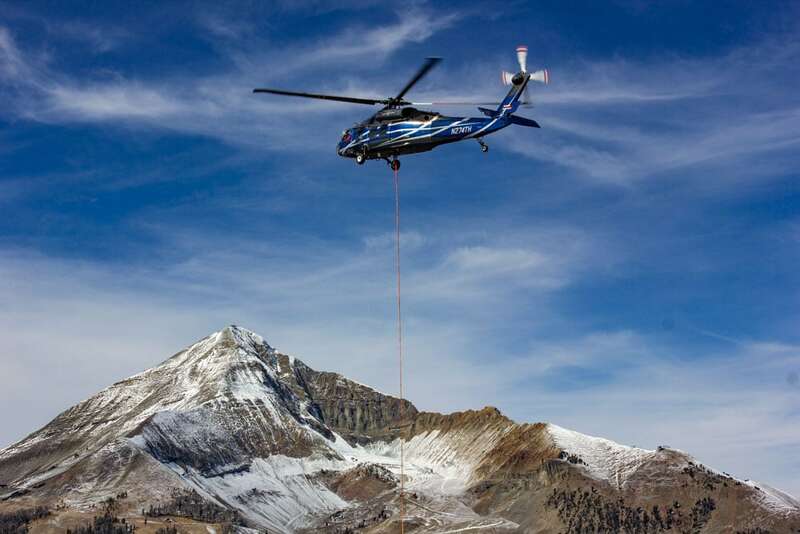 The haul rope for Ramcharger 8 has been produced by Fatzer AG Wire Ropes in Switzerland and is en route to Big Sky Resort. 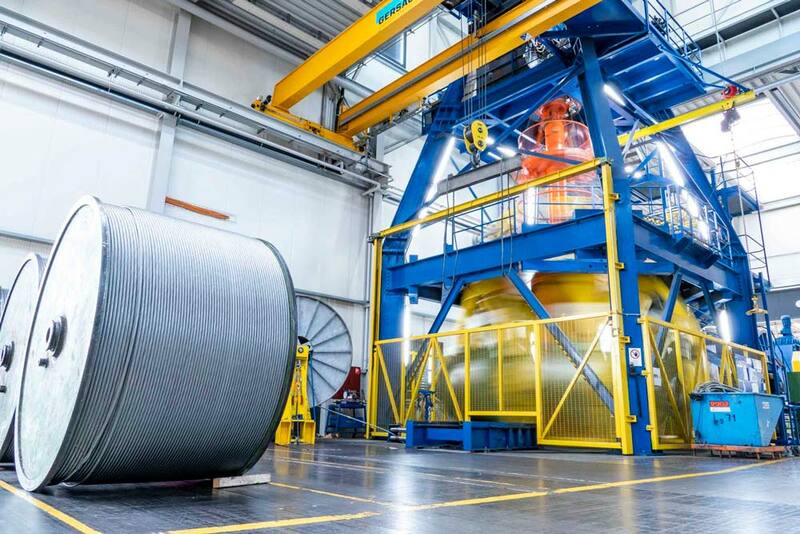 The combined weight of the haul rope is over 33 tons and measures at 54 millimeters in diameter. It is a COMPACTA rope comprised of 6 compacted strands, which provides optimal grip for the D-Line drive. When in place, it will be spliced into an endless loop using TRUsplice technology. 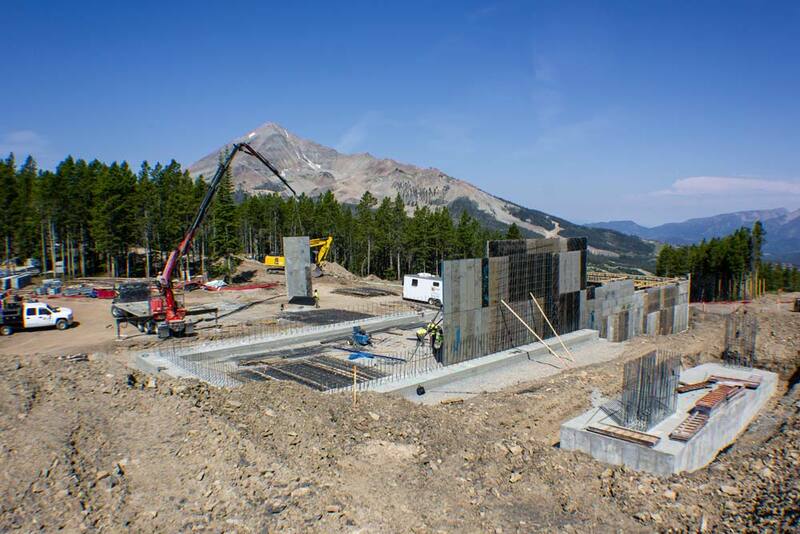 Concrete forms have been built to allow our crew to pour concrete for the Ramcharger 8 chair barn at the top of Ramcharger 8. 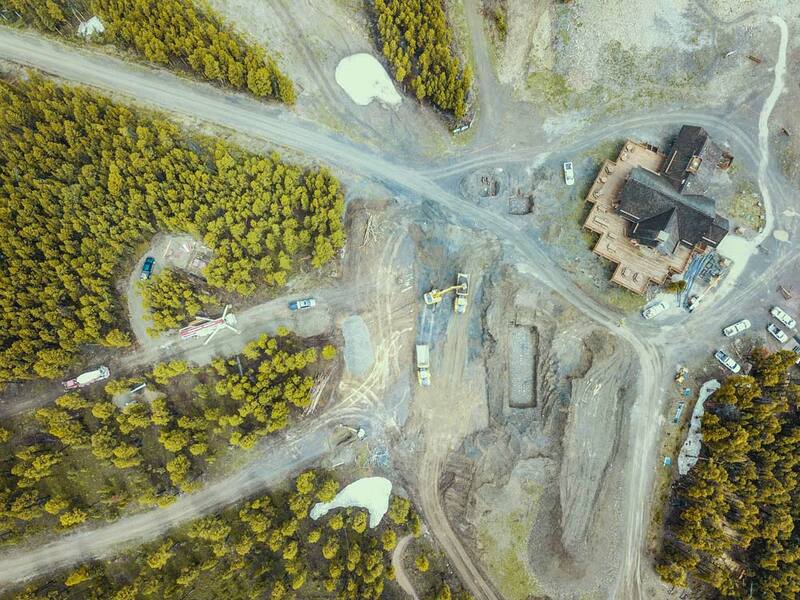 Crews continue their excavation work for the top terminal of Ramcharger 8. 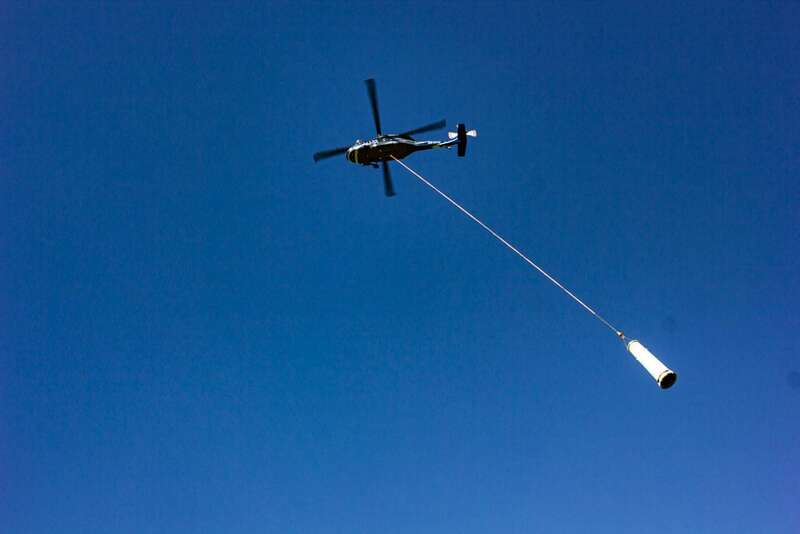 The former Ramcharger High Speed Quad's crossarms and lift towers were removed today with the help of a Black Hawk helicopter. A crane assisted in the removal of the bottom terminal of the former Ramcharger High Speed Quad.